Where Can I Sell My Handmade Goods Online? Maybe it’s the economy, maybe it’s the environment, or maybe it’s just that people recognize the value and beauty of an item that has been lovingly handcrafted by an actual person and not a machine. Whatever the reasons, handmade is in. If you’ve always been a crafter looking for an audience, now is your time to shine. Your audience is waiting, on the Internet. There have always been places to sell online, but you don’t want your hand-sewn doll clothes, hand-knitted scarves, or hand-carved jewelry boxes to get lost in the jungle of miscellaneous merchandise on places such as eBay and Craigslist. Instead, look for one of the sites set up specifically to cater to artists and crafters like you, and those who appreciate you. 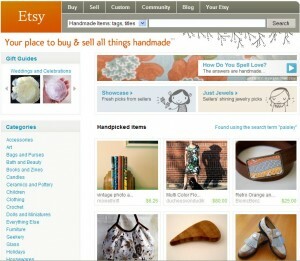 One of the most popular online marketplaces for handmade goods is Etsy.com, where anyone who makes something can set up shop for only 20 cents per four-month listing and a small fee paid to Etsy when the item sells. 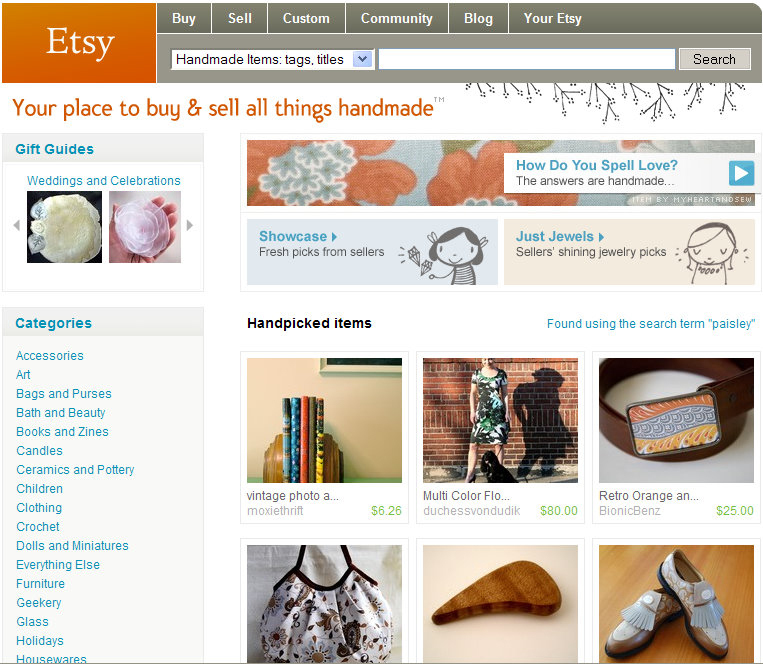 Etsy has categories for just about every kind of handmade item, and you can sell crafting supplies or vintage items as well. Etsy is big on community, so get ready to participate in the discussion forums and chat rooms, getting to know your fellow “Etsians” and being available to potential customers. If you prefer less of a free-for-all atmosphere, try a juried marketplace such as 1000Markets, RubyLane, or Lollishops. Juried means that a “jury” of the market’s choosing judges your handmade items. Each site has its own judging criteria which can be very subjective, but some buyers and sellers prefer what they feel is an overall higher quality level (though that feeling is pretty subjective too). If you get in, you’re in good company, since everyone there has had to jump through the same hoops. If you don’t, no worries, there’s always Etsy, or Artfire, another wide-open crafting marketplace similar to Etsy but with a flat monthly fee instead of a per-listing charge. And you can always try the juried sites again in a few months, when the jury just might be in a better mood.